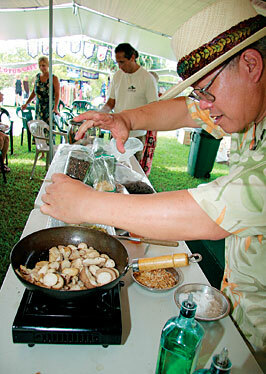 Leon Letoto prepares medicinal mushrooms during a Chinese medicinal cooking class at a Hawaii Healing Garden Festivals event. A life can be changed in just a few seconds. So it was when Oahu resident Katherine Fisher went on a monthlong trip to Tibet in 2002. "My trekking group had to cross a wide river in Central Tibet. While waiting for the barge that would carry us to the other side, the Tibetan people and the Chinese people sat on opposite sides of the road; the animosity between them was evident," she said. "One person in our group was a Croatian musician who had been through his own country's devastating civil war. He had carried his acoustic guitar with him across the plateau, sometimes on the back of a yak. » 11 a.m. to 2 p.m.: USTA Tennis Grand Prix champion Leilani McGee demonstrates Ayurvedic massage for professional athletes, and tennis on the lawn. » 10 to 11 a.m.: Plantioxidants: Miracle Medicines of the Future. Kauai naturopathic physician Dr. Michael Ancharski specializes in botanical medicine, therapeutic nutrition and natural childbirth. » 11 a.m. to noon: Hawaiian Noni Facts from the Farmer. "Mr. Noni" Steve Frailey of Hawaiian Health Ohana talks about the health benefits of noni (Indian mulberry). » Noon to 1 p.m.: Healing Arts of the Philippines. Speakers are registered nurse Patricia Aguilana and Virgil Apostol, a therapist at the Chopra Center for Well Being and co-author of "The Healing Hands of Hilot: Filipino Therapeutic Massage"; and "Vegan Foods for Health and Vitality" cooking demonstration by Mark Reinfeld, founder and executive chef of Blossoming Lotus and co-author of "Vegan World Fusion Cuisine." » Notes: From June 22 to 26, organic farm and garden tours and additional classes and workshops will be held at Malama Kauai, Kilohana Plantation and other locations on Kauai. Fees apply and advance registration is required. Call or e-mail for details. » Other Hawaii Healing Garden Festival and workshop/tour dates are Aug. 23-27 on Oahu, Sept. 27-30 on Maui and Nov. 1-6 on the Big Island. "The energy shifted as the children from both groups started laughing and dancing together, moved by the same music. Although the two cultures were in conflict, for that short time they were able to be just people, relaxing in the sunlight, joined by music. It was a magical moment of seeing how peace could be possible." In that instant, Fisher also realized that medicine, like music, is unique to each culture and that good health is something everyone in the world can enjoy by being compassionate and willing to share knowledge to achieve it. "Many rich cultural traditions and potent healing plants can be found in Hawaii," said Fisher, a student of ancient Ayurvedic and Chinese medicine, laau lapaau (Hawaiian herbal medicine) and the use of Philippine plants for nutrition and health. "What if the cure for your illness was growing in your neighbor's yard? What if that knowledge disappeared before you knew about it?" A sense of urgency to pass along such wisdom before it is lost and to help people explore the healing arts of different cultures spurred Fisher and Michael Saiz - a graphic designer, yoga instructor, environmentalist and water sports enthusiast - to found Hawaii Health Guide (hawaiihealthguide.com) in 2001. That comprehensive Web site, which covers everything from practitioners and products to retreats and restaurants, has since become one of the state's leading resources on health and wellness. While developing the site, Fisher and Saiz became associated with hundreds of health professionals, agriculturists, botanists, nutritionists, conservationists and other experts throughout the islands who all had valuable information to share. "We thought it would be great to bring health education outdoors in beautiful natural settings and places of cultural significance where people could learn, have fun and discover unique products and services," Fisher said. "We envisioned a celebration that would inspire and empower them to make healthy lifestyle choices." Thus was born the Hawaii Healing Garden Festivals, a series of annual statewide events focused on cultural healing arts and green sustainable living. Held on Kauai in 2005, the inaugural Hawaii Healing Garden Festival offered a week of activities, including cooking classes and symposiums on locally grown medicinal plants. Within two years the festival expanded to Oahu, Maui and the Big Island. The framework for each island's event is similar: talks and demonstrations by health practitioners; booths run by environmental groups; tours to farms and botanical gardens; children's activities such as gardening and vermiculture; and fairs showcasing health foods, supplements, organic products, sustainability services, books and plants. Fisher and Saiz discovered people from diverse cultural and ethnic backgrounds turned to many of the same plants for healing, albeit with different applications. For example, Hawaiians use turmeric (olena) topically to treat earaches, but it is taken internally as an antibiotic in China. "This year's Kauai event will bring together renowned ethnobotanists and practitioners of Hawaiian, Ayurvedic, Chinese and Filipino modalities," Fisher said. "Their presentations will show how much common ground there is in the world when it comes to medicinal plants." A lei contest with medicinal, edible, traditional and recycled categories was a hit on Kauai last year. "In addition to creating beautiful lei, participants put a lot of effort into researching and selecting materials that have health benefits," Fisher said. "We expect just as enthusiastic a response for this year's contest." Interaction is always a key component of the event. At the health fair, for example, attendees can get a massage, chat with local producers of plant-based products and find out how they can get involved with green projects in their neighborhood. "We feel there is no better way to do this than hands-on in 'outdoor classrooms,'" Fisher said. "Kauai, the Garden Island, provides breathtaking settings to experience the healing power of nature. "How do you protect Hawaii as it grows and changes? How do you motivate your community to be health-conscious and sensitive to environmental impacts? How do you invite people to learn that medicinal practices from faraway lands or from their neighbor's grandmother have merit? It's exciting and rewarding to find answers to those questions and more at the Hawaii Healing Garden Festival."